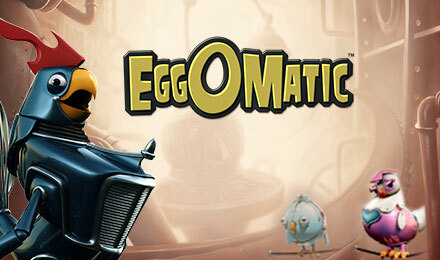 Play EggOmatic Slots online | Claim 60 FREE Spins! Watch out for these crazy chickens when you play EggOmatic slots! This slot is packed with bonuses like the Spreading Wild, Free Spins Egg, Surprise Egg, and Coin Win Egg! EggOmatic Slots is quirky 5 reel, 20 payline slot game set in an egg factory filled with wacky chickens! You’ll have a blast spinning the reels with these fun robotic chickens, special symbols, and incredible bonus features! There are several Bonus Eggs including the Spreading Wild. When a Spreading Wild Egg drops on a Wild symbol all symbols adjacent and diagonal will turn wild! If you see a Free Spins Egg on the conveyer belt above a Wild, you’ll be rewarded with up to 50 FREE Spins! The Coin Win Egg can score you up to 2,500 extra coins and the Surprise Egg will give you a special hidden prize!